Functional magnetic resonance imaging (fMRI) can be used to predict efficacy of candidate analgesic drugs, reports a study published February 11 in Science Translational Medicine. In the new work, led by Eugene Duff of the University of Oxford, UK, researchers used a machine learning algorithm to identify fMRI signatures of brain activity correlating with efficacy of conventional analgesics, using datasets from previously published human studies. In the future, these signatures could be compared with those produced by new test compounds in order to prioritize drugs most likely to succeed in clinical trials. Duff collaborated with investigators from Cardiff University, UK; King’s College London, UK; Pfizer Ltd., Cambridge, UK; and the University of Michigan, Ann Arbor, US. Clinical trials of candidate drugs are expensive and time consuming. Establishing a way to prioritize drugs that are likely to be clinically efficacious can mitigate costs and streamline drug discovery. For Duff, developing a screening methodology to identify promising analgesics was his main goal, given the difficulty the pain field has seen in bringing new CNS medications to the clinic and the wealth of fMRI imaging data available from pain studies. Duff and his collaborators used fMRI data from eight previously published placebo-controlled, crossover studies examining the effects of various analgesics, including gabapentin, pregabalin, tramadol, remifentanil, tetrahydrocannabinol (THC), and naproxen, on brain responses to painful stimuli. These earlier studies included healthy patients and those with pain conditions, and varied in the nature of painful stimuli subjects received (e.g., a thumb squeeze or a punctate stimulus) and the timing of fMRI scanning after analgesic administration. The group’s aim was to find reliable fMRI signatures of analgesic-induced brain activity and drug efficacy using the eight trials as their dataset and a machine learning algorithm that gradually learns from its inputs. The researchers applied their drug assessment procedure to each trial individually and then used the data from the remaining studies to identify the fMRI signatures. The team first determined if a drug had a reliable effect on fMRI brain responses (i.e., a pharmacodynamic effect) differing from that of placebo. Then, the investigators looked for fMRI signatures of clinical efficacy. Here, they wanted to identify a common fMRI signature of the effects of the established compounds used in the trials, as well as a signature associated with normalization of brain responses to painful stimuli after analgesic administration. Results showed evidence of a pharmacodynamic effect in seven of the eight tested fMRI studies. In the successful drug assessments, analgesics could be distinguished from placebo with an accuracy of 70-92 percent by the machine learning algorithm. In terms of clinical efficacy, evidence for an analgesic effect was found in all but one of the eight studies, and analgesic sessions could be identified with 57-83 percent accuracy. “Our method doesn’t give us absolute confidence that the fMRI signatures we have identified are the only ones associated with a reduction in pain, but these markers can give researchers more or less confidence about a particular drug,” Duff told PRF. In a Focus article accompanying the new study, Tor Wager and Choong-Wan Woo of the University of Colorado, Boulder, US, emphasize that the “results provide new clues about the complexity and organization of brain systems affected” by analgesic drugs. For instance, they note that “the brain features that discriminated drug and placebo conditions were distributed across many brain systems. Some of these, such as the anterior cingulate and insula, are strongly associated with somatosensation and pain as well as decision making and emotion. Others—including the amygdala and the orbitofrontal, parahippocampal, and lateral prefrontal cortices—do not appear to have a straightforward relationship with nociception per se but are strongly implicated in aspects of emotion, expectation, and affective learning.” Wager and Woo also stress that the approach used by Duff et al. could help elucidate differences between drugs in terms of their effects on different types of pain and in different individuals. The new research also provides a rationale to make “Go/Stop” decisions on whether or not to move new analgesic compounds along the clinical trial process. For instance, if a new candidate drug scores well against an algorithm trained on conventional analgesics that have been shown to provide good analgesia, then a “Go” decision may be warranted. Of course, pain researchers are working to develop new analgesics with entirely novel mechanisms of action, something that the approach described in the current research can also help facilitate. For instance, such a drug candidate might score poorly against the algorithm and would be expected to produce different fMRI signatures. The study also opens up the possibility of repurposing existing drugs to treat pain. For example, “If you decide to look at the brain effects of a beta blocker normally used to treat hypertension, and it produces brain activity similar to analgesics, you have found a new use [for an old medication]; there are so many potential new uses of old drugs,” Wager told PRF in an interview. One challenge for future studies, Wager and Woo write in their commentary, is to understand how the fMRI signatures identified in the current study relate to health outcomes, including chronic pain, and the relevant brain processes underlying the signatures; they say these could include a host of systems-level brain processes involving perception, motivation, decision making, emotion, and others. 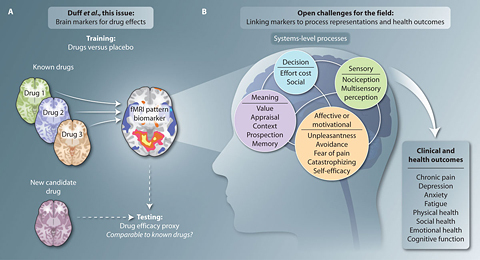 “Understanding the mappings among drug effects, mediating mind/brain processes, and observable health outcomes is a major, open challenge for the field, and the framework provided by Duff et al. provides a concrete way of bringing drug effects into the picture,” they write. Finally, the study was a proof of concept that will likely be refined to suit different needs and interests. One particular strength of the study’s methodology is that any existing fMRI dataset of the brain response to drugs can be used to create signatures of efficacy. “This is a general procedure that can be used for a wide range of conditions,” Duff said. Abdul-Kareem Ahmed is a medical student and freelance science writer in Providence, Rhode Island, US. fMRI in analgesic drug discovery. Sci Transl Med. 2015 Feb 11; 7(274):274fs6. Learning to identify CNS drug action and efficacy using multistudy fMRI data. Sci Transl Med. 2015 Feb 11; 7(274):274ra16. Baseline reward circuitry activity and trait reward responsiveness predict expression of opioid analgesia in healthy subjects. White matter integrity of the descending pain modulatory system is associated with interindividual differences in placebo analgesia. A Brain Signature for Physical Pain? An fMRI-based neurologic signature of physical pain.